ARIS Games, which stands for Augmented Reality Interactive Storytelling Engine, are location-based games and stories. It is an app that allows you to create games, tours, and interactive stories. ARIS Games was created by Field Day Lab, based at the Wisconsin Center for Educational Research at the University of Wisconsin. Their approach centers on “the intersection of theories of interactive media and situated and sociocultural learning.” The ARIS app allows researchers and educators, even children, to create their own interactive media. 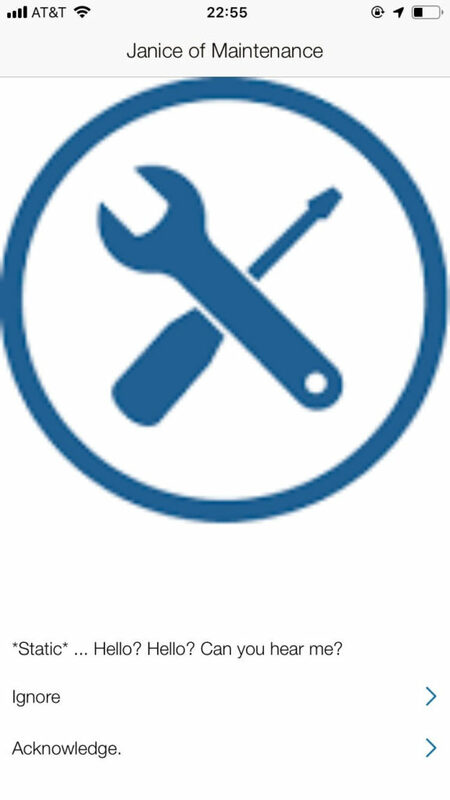 This program is free to use, if not easy to navigate. First, you need to register an account. Once you choose a user name and password, you are given the option of making a new game, editing an existing game, or importing an exiting file. I chose making a new game. Now, without the manual, this website is really hard to maneuver. Fortunately, the manual provides step-by-step directions and video tutorials, which I used to get started. I decided to create a tour of the American University campus. The first thing I did was create plaques for all the hot spots on my tour: CAS, SIS, and the Spiritual Center! 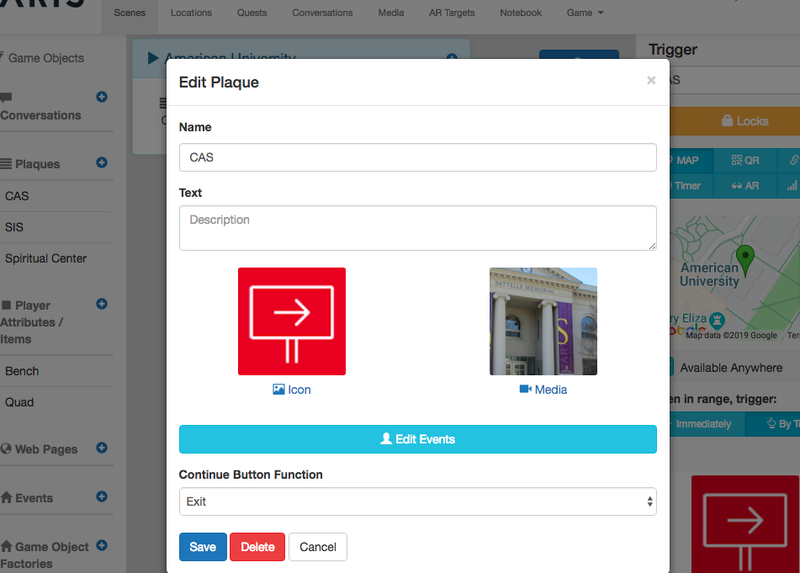 A plaque is an object that provides your audience with information, either in the form of text or media. Then I made sure the locations of those plaques were correct. The default will always be Wisconsin (where the program was created) so I had to manually move the markers on the map to the correct locations. Next, I added media to my plaques by selecting the plaque and editing. I gathered some photos from the AU website, though I could have easily used my own photos or videos. Once included media, I added triggers. This tells the app when to allow the viewer access to the plaques. 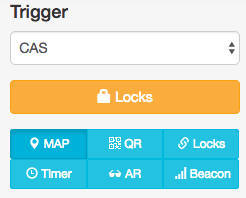 I’ve set all my triggers to geographic location. When the viewer is in the radius of the pin, they will be able to access the information. I could have also used a QR code. Lastly, I created a conversation, which provided an interactive way of communicating with the audience (see example below). 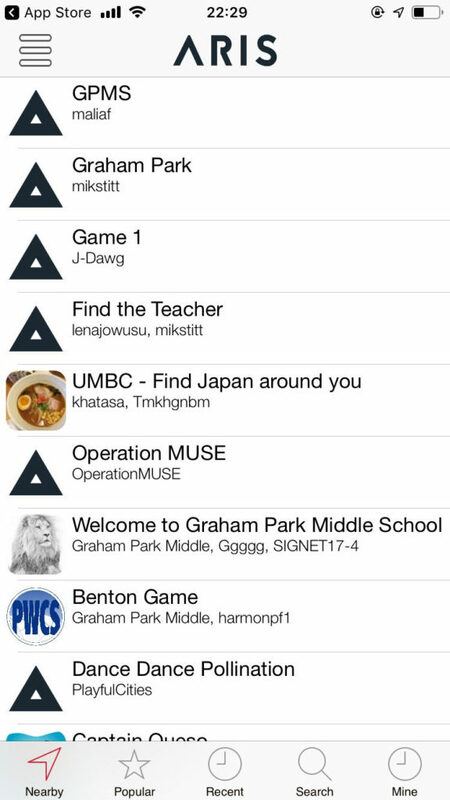 You can use the app to locate nearby games, tours, and quests. I will highlight two that were particularly interesting. I’m not sure what is happening at Hurst Hall, but I’m a little scared to find out. 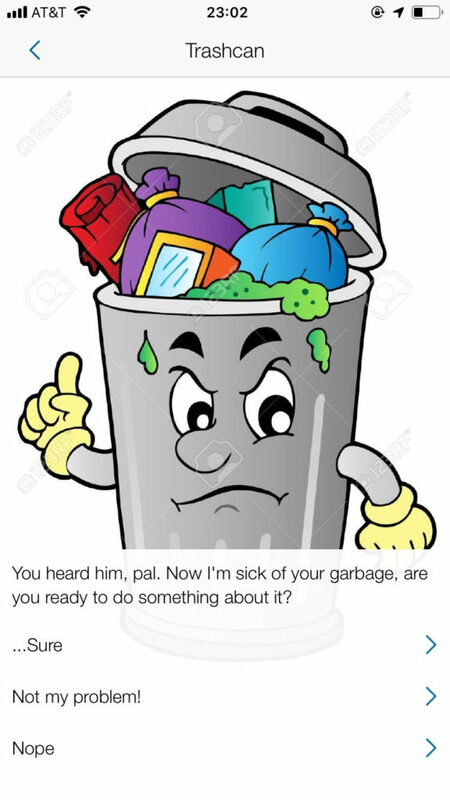 This quest is intended to promote recycling. 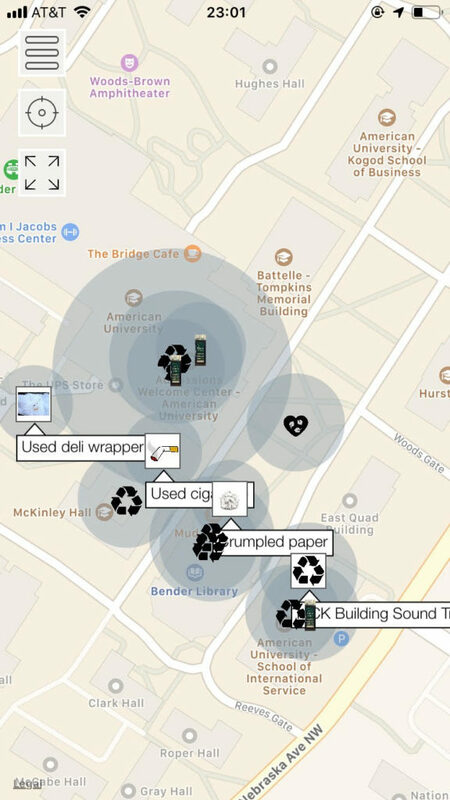 It indicates where garbage has been found across campus and sort of guilts you in to doing something about it. Overall, this is a really cool app. It provides a platform for scholars and educators to create a game or tour that allows the audience to interact with the space around them. 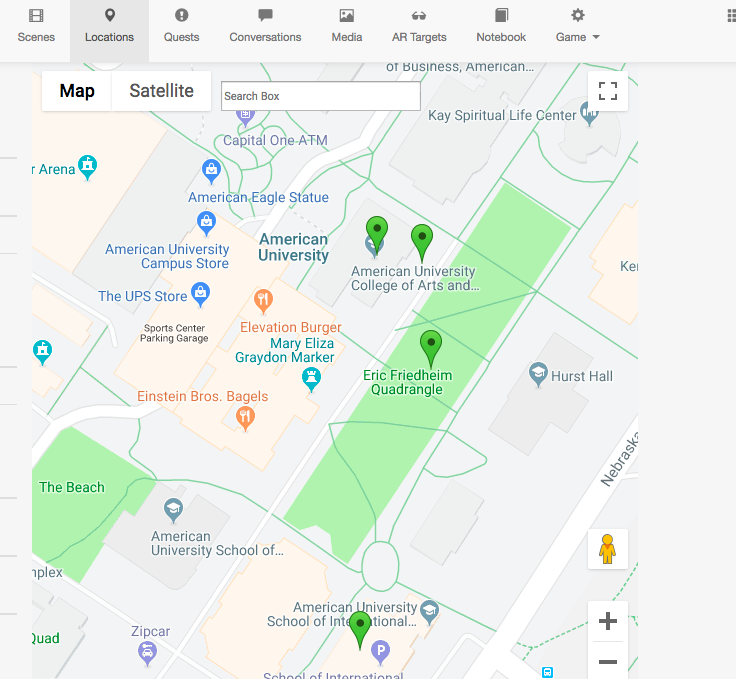 By using the map on American University campus, I was able to consider my space through a multitude of different lenses: conservations, history, fiction, etc. How do you see an app like this contributing to your own research interests? Based on this short overview, what are the benefits of using map-based interactive apps? What are the drawbacks? “Free to use, if not easy to navigate” seems to be one of the themes of these do-it-yourself digital history websites. 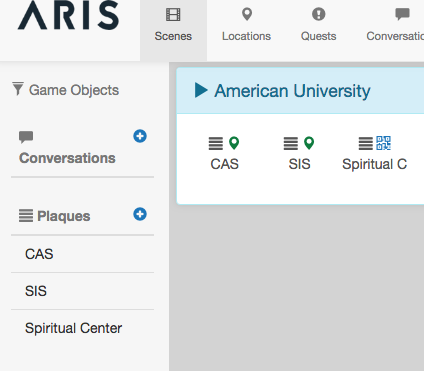 That being said, I was immediately struck by the possibilities ARIS Games creates, especially for museums that are looking to create a low-cost digital interactive. I’m especially imagining outdoor museums that cover a lot of ground and where visitors can wander around on their own. A map-based digital interactive might give visitors the ability to chose their path, but still learn the main points the museum hopes to convey. Thank you for this post! One of the games that caught my attention was Field day. Using ARIS Games, Field Day, based at the University of Wisconsin, aims to help one teach and learn in innovative ways. While exploring the program and their site, I came across a blog post called “Teacher Craig Brumwell Designs a Mobile Game with ARIS to Create Emotional Impact for His Students.” Craig used ARIS to create a situated documentary game called “Dilemma 1944” to convey the impact of the Second World War. In the game, players travel back to Kitsilano High School in Vancouver during WWII. While the concept itself is not new, there are some ethical concerns. For instance, one may point out that someone in the present could never replicate the experience of the past (especially traumatic ones), and that any attempt to do so would trivialize the experiences of those who lived them. At the same time, some of the research on this is incredibly promising. What do you think of this game? This technology is really fascinating, but my first thought was one that AJ brought up in his post about Mobile Interface Theory: this sort of tech only works as an educational tool when users possess a smartphone capable of running the program and the tech literacy to use it. As a supplement to other programming this has lots of potential, but I worry that museums looking for ways to chase tech fads or keep costs down as Katie suggests in her comment might end up limiting who can access and benefit from these programs. After your presentation in class today, I was inspired to look up whether there was a curated list of good ARIS games. The ARIS website features a WWII-based game, created by a high school teacher, that aimed to make WWII real his students. The game had students follow the path of past students on their decision on whether to join Canadian forces fighting in Europe and Asia, participating in the types of conversations they would have had with friends and family and watching news clips about the war to force students to truly weigh the implications for the decision either way. There were various assignments along the way to help students recognize the complex dimensions of the topic and at the end, the students used the school’s memorial to determine if they survived the war or not. I think this is a fantastic way to use ARIS for history purposes. It makes the history extremely personal and impactful, especially since every person was interacting with the story on a one-off basis. However, I wonder whether this type of game would be successful outside of a class setting. Also, this game clearly took a lot of time, research, effort, and love to make, so that is not something that we can really expect from too many history institutions.